The first objective of the year is completed, yay! 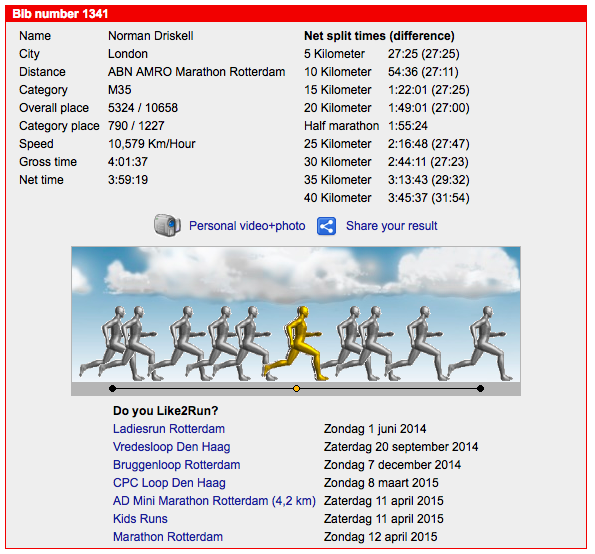 I'm still super-happy about my 03:59:19 at the Rotterdam marathon. There's a lot of year left though, and a lot I've signed up for (have you seen the 2014 race calendar panel over there on the right hand side?). Need to take a rational look. What's practical. I've withdrawn from the Eton 10km swim - I still intend to do one, but i need more than 5 weeks training to prepare (particularly seeing as there's Mallorca 70.3 in the middle!). I also decided not to do today's Thames Turbo Triathlon - there's no need to race a hard sprint when I'm still only a week after the marathon. Instead I went for a ride with Mrs on our "3 Hills" route - first time for a year. Loved it. I enjoyed having a training plan for the last few months, even if it was just out of a book. I like not needing to think about what needs to be done. However, I don't feel ready to get a new coach. Maybe next year, maybe never, but not right now. So, what's the plan? The plan is: write your own plan. Here's the plan. Brett Sutton wrote a piece on swimming for the Buccaneer Race Team. In essence, the message was: "Want to get better at swimming? Well then swim more." So, let's just swim some more then. I bought a book called For Swimmers 365 Main Sets a while ago by Ironman swim-master Andrew Starykowicz. It's basically just what it says on the tin. I'm going to start from set one and try to do 2-3 per week. That's easy - I just schedule them in, and do them. My main races this year are both quite hilly - Ironman 70.3 UK in Wimbleball with its (in)famous "52 hills in 56 miles" or whatever it is (I think the bark is worse than the bite to be frank), and then Ironman Wales in Tenby - where I'm determined to ride better than last time. So I need to ride up hills, and ride them regularly. I'll be racing Wimbleball on my road bike and Tenby on my tri-bike, so I need good miles on both. I should be able to get mid-week miles just by commuting whenever I can, and then a longer ride at the weekend to/from a parkrun or round in the Surrey hills. I'd like to revisit the Ride London 100 route ahead of this year's event (I was lucky enough to get a ballot spot), the Hell of the Ashdown route, and there's scope to make our 3 Hills route into a lot more than three hills. Running is trickier. The marathon training had me running 4-6 times per week, and my highest weekly mileage ever. I can't sustain that on top of everything else. Running breaks you down. The long run is important - one of the Pfitzinger & Douglas training principles is the value of the mid-week long run. I should therefore work in a run home from work during the week to compliment the weekend long run - or maybe a couple of runs home per week and free myself from the need to run long at the weekend all together. The main thing is that each session is quality. It needs a purpose. When I'm approaching the shorter races I should be running fast, and when I move towards Wales I should drop the pace a little and work on endurance. I also need to learn to love the hills! Throughout I'd like to get back to running hard and fast parkruns. It's OK running them as recovery runs, but I miss just running as fast as I can, and that's a quality session in itself. I think 3 runs per week should be about right - and, importantly, a sustainable volume. I've really enjoyed hitting the gym regularly - I feel stronger and more resilient. This makes me better able to accommodate training without getting injured again. The guided strength and conditioning sessions seem to be working so far. Twice weekly visits to Ben and Josh at Athletic Edge will remain. Monday and Thursday mornings seem to work. Swimming in the evening after a gym visit in the morning seems to work well for me - active recovery and hopefully eases the DOMS a bit (and man those guys are the kings of DOMS). This is where it gets harder. It's impossible to peak for every race, particularly if you've signed up for a lot. You need to build and peak for your main race. Training is also normally divided into micro and macro cycles, e.g. 4x 4-week blocks making a 16-week block, with each 4th week reduced in load to allow a little more time for recovery and accommodation (absorbing the training so you actually get faster as a result). Specificity is ensuring your training is relevant. My training for Rotterdam was all on the road and didn't contain many hills - that's because the race was a fast flat road race. Wimbleball and Tenby are both hilly on the run, so I need to learn to love the hills in training. Likewise for cycling. I'm not worrying too much about swim specificity, other than I'll need to get open water and wetsuit swimming in as often as I can - this has been a failing in the past, and I think partially responsible for my frustrating swim-start freak-outs (see both Ironman Wales in 2012 and Ironman 70.3 Zell am See/Kaprun in 2013). Up to Wimbleball I'll work on faster mid-distance training, and then build up the duration afterwards ready for the big fella in Tenby. What are my A-races? For A-races I want to be peaking and tapered (fresh, from a de-loaded week). I should be champing at the bit, raring to go! I've done both these races before and I certainly have much more to give. What are my B-races? For B-races I want to treat race day absolutely as if it were an A-race, however I won't worry so much about a full taper before hand. It's more about real race experience and sorting my technique, and less about pulling about a top (for me) performance. What are my training races? 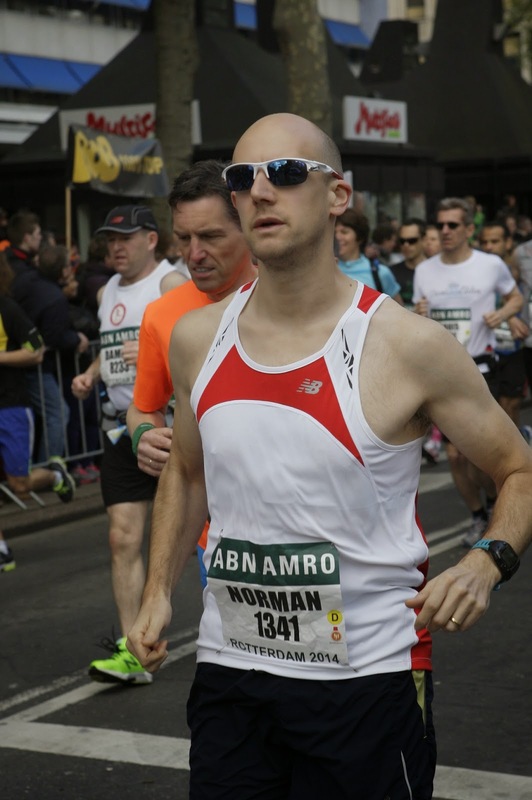 Training races are just to get experience, try out my race day strategies, and have fun. I won't taper for them and won't pay too much attention to the results. These are the "everything else" category. The only one of these that needs care is the long course weekend. This is an Ironman on the Ironman Wales course (near enough) but split across three days. This will be hard effort, and the marathon will take time to recover from even if I run it at Ironman pace (i.e. very easy). And then there are the wild-cards... These races are on the "would like to" list. Not confirmed or entered. I'd really like to run an ultra with my Mrs at some point! These don't really feature in my thinking right now. ...and there's so many other things! As it happens, the timing works out perfectly - it's almost as if I'd planned it (I hadn't). I'm going to go for two macro cycles - one for Ironman 70.3 UK, and one for Ironman Wales. There are two four-week blocks from now until Wimbleball, then after a recovery week there are three four-week blocks leading up to Ironman Wales. The B-races come at the end of build periods, and have de-load weeks afterwards. This is ideal. Build up to Ironman 70.3 UK, started today! I like the idea of doing a race simulation two to four weeks out. A popular technique is to complete the number of miles, but in kilometres. Simulate the race entirely, including fast transitions and fuelling, but don't suffer the fatigue of going full distance. For the 70.3 that's 1200m swim, 56km bike, and 13km run - those distances are short enough to go pretty hard and really enjoy it. May 31st looks like a good time for that - the weekend before we'll be at Wimbleball Lake checking out the bike course - unfortunately you can't normally swim in it, otherwise that would have been ideal. For the full distance it's 2.4km swim, 112km ride, and 26km run - a bit more of an undertaking, but training should mean the distances are achievable with some good effort. It's an ideal kit and nutrition test. The more you treat it like the real thing, the more it will help. I could get a really big weekend in right at the start of my final block - I'll be relatively fresh after a de-load week. Pencilled in for 17th August. Block one, week one: Need to take it easy, this is about getting the right sessions done and building good habits. Set the plan and stick to it. I need to remember I'm only one week post-marathon - I'm feeling fine now, but I will probably find hard efforts, well, hard. I'd like to get started on the 365 main sets too. Real life is difficult this week, very busy at work and my 5th wedding anniversary on Thursday. Week one - Monday done! Block one, week two: I'm on a training course all week this week so as long as I can stick to mornings and evenings I should be OK, however bike commuting is off the cards (remember you have a turbo trainer and a lot of The Wire to watch...). I enjoy a little training during these times, it helps clear my head and be able to focus in the classroom. The end of the week will be hard, Mrs and I are crewing for Louise at the Thames Path 100 (boy, can that girl run!). Block one, week three: In Mallorca from Monday. Looking forward to riding the 70.3 course a few times ahead of the race. This week will be about cycling and swimming, I'm not so concerned about running. The race is on the Saturday, so Sunday will be a lovely day off in the sun. Block one, week four: A de-load week at the end of my first block. The aim here is to keep the number of sessions up, but the intensity down - not stopping completely but taking the opportunity to recover well. There's loads of other stuff to consider - kit, nutrition, race plan, etc. I could plan for hours. Let's see how this first block goes. Alarm went off at 7am disturbing me from some very bizarre dream where I needed someone to sign a permission form for me to use a rowing machine in a bike shop (no, I don't know either). We hopped (sort of) out of bed and went down for breakfast. The breakfast area filled up with lithe sporty looking people while we were in. I filled up on bacon and eggs, some cucumber and tomato, and a few bits of cheese. We got slightly odd looks for not stuffing our faces with carbs. Sorry athletes, that's just how I roll. A coffee to kick-start my brain, and I'm fuelled. This will be an interesting experiment - I completed Ironman 70.3 Zell am See/Kaprun on water with 2 gels in the run and that was around 6 hours, but I've never run this far on LCHF (low carb, high fat). I've decided to take 3 gels with me "just in case". I'm prepared to eat them at 2 hours, 2:30, and 3 hours in - but only if I feel I need them. One has caffeine in case I really need a boost. I'm also prepared to throw them all in the bin in the first 5km if they jiggle around too annoyingly in my bum pocket. I'm not planning on drinking any sports drinks from the aid stations, just water as and when I feel I need it. It all depends how far up my effort level I am. The harder I work, the more carb I'll burn - even though I'm well fat-adapted I will still burn some carb, just less than my fellow runners. I can go further (much further) without fuel, but there's a limit. If I go really hard, then I'm expecting to need something. I don't know, it's uncharted territory - we'll see what happens. When I get back to London I should get a gas analysis test - that'll tell me precisely my fat/carb fuel mix at different intensities - then I'll know for sure how much I should need to eat, and roughly when. Mrs had this done quite a while ago and the results were really interesting - I didn't see the point at the time as I wasn't very well adapted for fat as a primary fuel. 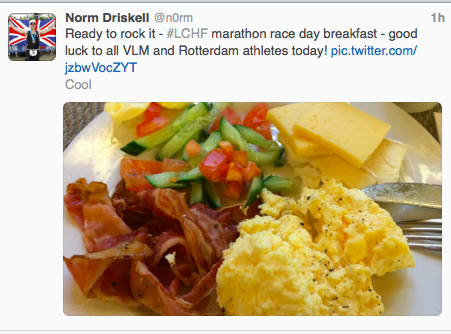 The marathon organisers have just tweeted that there are pacers! I don't know why this surprises me - it's a big marathon, of course there will be pacers. My target pace of 5:30 per km would get me in 3:52:04 if I ran it absolutely evenly. 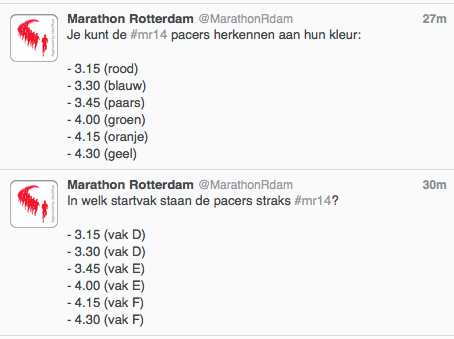 There's a 3:45 pacer who will be running at 5:20 per km if he holds even pace. He'll be starting behind me (I'm in the 3-3:30 start pen, I was originally gunning for a 3:30 finish but thought better of it as my training progressed!). So I should set off at 5:30 per km (as per plan, even if it feels slow, it's correct - and if I'm faster, SLOW DOWN! ), after a few km the 3:45 guy should catch me up, do I go with him? He'll have a big "bus" of runners with him, 3:45 will be a popular goal I'm sure. He'll only be 10s per km faster than me, 10 seconds in 5:30 is 3%. Sounds like nothing, but would be a big difference over that time and distance. Set off at 5:30 per km. Hold 5:30 per km. Let the 3:45 guy pass me (he should only drift by slowly - 3% faster in fact. I hold him in sight for a long time, it should take many minutes for him to pull away. When I hit 35km I see how I feel. If I think I have more, and can hold it to the end, I'll give it a nudge. 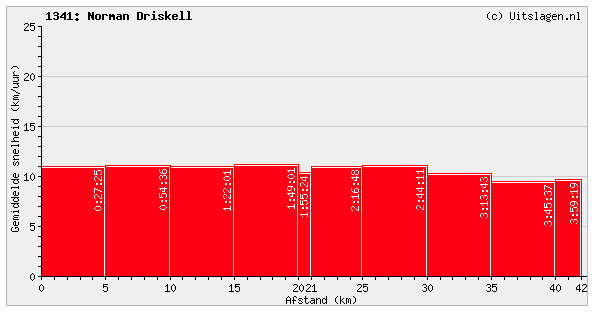 If at 40km I think I have a little bit more, I'll give it a little bit more. I won't get distracted by the 3:45 guy, but if he happens to stay in sight and it looks like I can catch him in the final 10km (not having been dragged round by him - I made that error with the 1:40 guy at the Royal Parks Half two years ago) then I'll wind it up. I know I have a strong finish, I know I can dig deep and find more than I think I have. The challenge here is not physical, it's mental - stay on plan. I took to my start pen about 25 minutes before the off. Everyone seemed relaxed, a few people were warming up (well, I think that's what they were doing). I sat for a while, taking it all in. Finally here. A marathon that I've trained for and really hope to complete. I was feeling confident on a finish, but very unsure of what time I could pull off. Then, after a rousing chorus of "You'll never walk alone" (no, I don't understand why either but the Europeans seemed to enjoy it) the canon sounded and we were off! Sort of! As I was in start pen D there was a fair amount of shuffling to be done first. Thankfully when we crossed the timing mat and our clocks were officially ticking there was room to run. I'm not sure the time difference between the gun and me crossing the mat - it'll be clear later why I wish I'd paid more attention. What a completely different experience to yesterday - everyone was running, most people were going in straight lines, and no one was dying horribly (well I would hope not, in the first 5% of the race). I was determined to hold my 5:30 per km, as planned. As predicted the 3:45 pacer arrived before too long, between 5km and 6km. I was suddenly enveloped in a jostling crowd. I briefly considered staying with him, but decided not to - I had a plan, you don't change it on the day, and you certainly don't change it randomly in the race! The kilometres were ticking along nicely, all between 5:20 and 5:30 - perfect. No reason for heroics. I let a lot of people overtake (I was in the wrong starting pen, after all) and didn't let it get me down. I focused on keeping good cadence (90-92 steps per minute) and clocking up the kilometres on pace. I was loving it. Absolutely loving it. Pacing was easy and the kilometres were flying by. I saw my first walking person at 18km, looking a bit broken. I remembered thinking at 7km that I was a sixth of the way, then at 14km a third - only another sixth to get to the half-marathon point. That came up in no time. Half way passed with a few more walking people, the tide was coming in a bit and I was moving up the field. No additional effort required, I was just faster - but still on my pace. The next mental targets were at 28km which is two-thirds distance, and then from 32km it was a single-digit count-down to success! I ran over the race-logo landmark bridge for the second time, marking the first and larger of the route's loops completed. Following a few more km winding round the city centre we were out for the second loop. As 30km went by I was full of happy. I had slowed for water at 10km, and 20km, missing out every other station. The weather was lovely, sunny, warm, with a gentle cooling breeze. I was thinking I would run the whole race on water - what an outcome that would be! How quickly things can change. It got harder to hold pace, and my thoughts got more negative. The kilometres still seemed to be passing well but were taking a lot more effort. I passed my first "dead" person - he was sat in the bushes (where people (and people here equals "men") were ducking in to pee). He was sat with his back leaning on a tree sobbing. A spectator was trying to talk to him, but he didn't seem to want any of it. Or maybe they didn't have a common language, it was hard to tell. Walkers were more plentiful now and they took a fair bit of avoiding. I thought about the gels in my pocket. If you get random negative thoughts then fuelling may be required. I decided to go on water for a bit longer. By 34km I was finding the going hard. My pace had really dropped and my legs were hurting - primarily my hamstrings and calves and Achilles tendons. I could still put the effort in from my mind, but I didn't seem to get any faster. Just before 35km I had a gel - it was bloody lovely. At the 35km point I had another one, and a couple of cups of water. I quickly felt better mentally, but still couldn't make my legs work any more. I vowed to have my final gel, the caffeinated one, at 40km. I saw a few more dead people. At 38km or so there was someone receiving what I can' only describe as "emergency medical attention", there were people in uniforms and beeping boxes. Not good. I told myself that I was trained for this, that I could do it. There was need to walk. I refused to walk. I didn't walk. In any training run I'd have stopped by now, or worked out a "walk 60s, run the rest of the km" tactic. I kept in my head that this wasn't a training run, this was the real thing - I declared to myself (out loud) that I refused to walk unless I literally couldn't run. And that point never came. 40km came though, and I walked through the aid station to take my gel and drink a couple of water cups (that bit of walking was allowed). For the first time in the race I looked at my total elapsed time - it read 3:47 (no seconds displayed when you're over an hour). 3 hours and 47 minutes and 40km done, 2.2km to go and 12 minutes and an undeclared number of seconds to go if I'm to get in under 4 hours. Oh God I'm going to have to run harder. This is what "running harder" looks like when you've got 41km in your legs - ouchy! The clocks on display showed gun time, of course, so I had no idea what I was aiming for by those clocks - and my watch display was set to show me cadence and heart rate only (kilometre splits would pop up for 10 seconds each kilometre). I had no choice but to run hard. Running hard after this long was a mission. I missed the 41km marker - was it even there? Before i knew it there was a huge "1000m" on the ground - just a kilometre to go. Got to run harder. We were back in the town centre now, at 500m to go there was a sharp right turn and I could see it - the green finish banner in the distance. I had no idea how long I had, I just had to try and run harder. It was, admittedly, a bit pathetic - by no means a sprint finish, but it was at least faster than I'd managed the last 5km. With 300m to go I had to avoid a man carrying his tiny child down the finishing chute. I'd like to take a second to ask why, WHY, do people do this? It's crazy, I'm running as hard as I can (let's ignore how fast that actually is for a moment) to get in under 4 hours, I can hardly see any more, I certainly can't run straight, and I definitely couldn't take anything that would pass for "evasive action". I can't guarantee I'm not going to bump into anyone - and if I did and they fell over and the kid got hurt, then what? It's rank stupidity and should be banned. 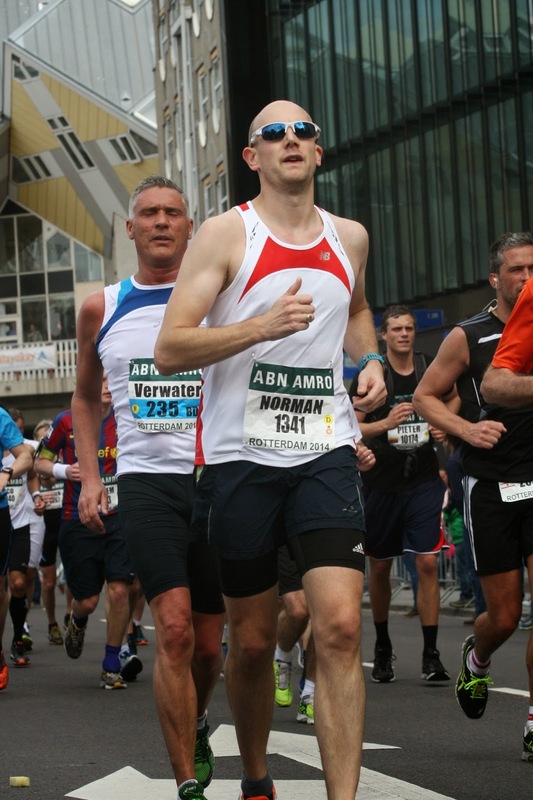 As it was I crossed under the line in about 4:01:30 or so according to the clock on the banner and stopped my watch. Was it good enough? No idea! I stumbled around a bit and eventually had to lean on the crowd control barrier. I was absolutely buggered. My legs were on fire, I could only just stand. It took me a while to operate my watch - you need to "save" the exercise before you can review it. Did I make 4 hours? Yes, yes I bloody well did. 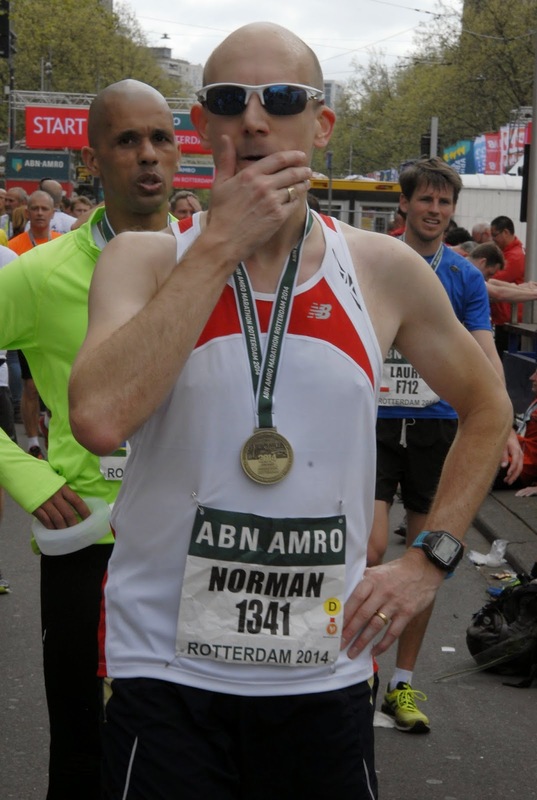 According to my watch I'd completed the Rotterdam Marathon in three glorious hours, fifty-nine painful minutes, and nineteen bloke-with-a-child avoiding seconds. 41 seconds to spare, and even if I was a few seconds off at each end with my watch-button pressing I should still be under 4 hours. I pumped the air in celebration a few times - every little bit of "don't walk" and "come on, push harder" was worth it. Every single good choice had contributed to achieving my goal. By just forty-one seconds! Need to work on what happens from 32km to 42km! Now, give me my medal and point me at the bar. Safe in the knowledge now that I'd hit my goal and didn't have to run anymore, the pain started to come. My hamstrings, quads, calves, and flutes were all tightening up and starting to feel cramps. I could hardly walk for the first few minutes. I staggered through the other finishers, they were coming thick and fast, and past the stalls of bananas and iso-drinks. I found a space to sit on the floor and spent 5 or 10 minutes stretching out. Others around me were doing the same, there was much grunting from representatives of many different nations. It turns out "argh" is a word in every language that means "I've just run hard for four hours and sat down, and now I can't get up again". I got up in the end, took a few more waters from the stalls, and tried to get out. There was a big queue to get out so I had to stand/shuffle for 5 or 10 minutes - it felt like forever. Why was there such a queue to leave the finish area? It was because all the friends and family that came to meet the runners clearly had to stand right at the exit, as close as they could possibly get. The result was that runners had to file past, in single file, for about 20 metres to get through them. Thanks guys, thanks a lot - can we have some room? We're knackered, can hardly stand, and really need a bit of space. I walked very slowly back to the hotel room - my legs were completely ruined. Mrs arrived about 20 minutes after me, similarly broken. She had gone off too fast and had a tough second half. She came in with a great time though of around 4:23 - she was aiming for under 4:30. Objectives achieved. First thing is first - pub for my second lager of the year! We were both hurting far more than we thought we would. 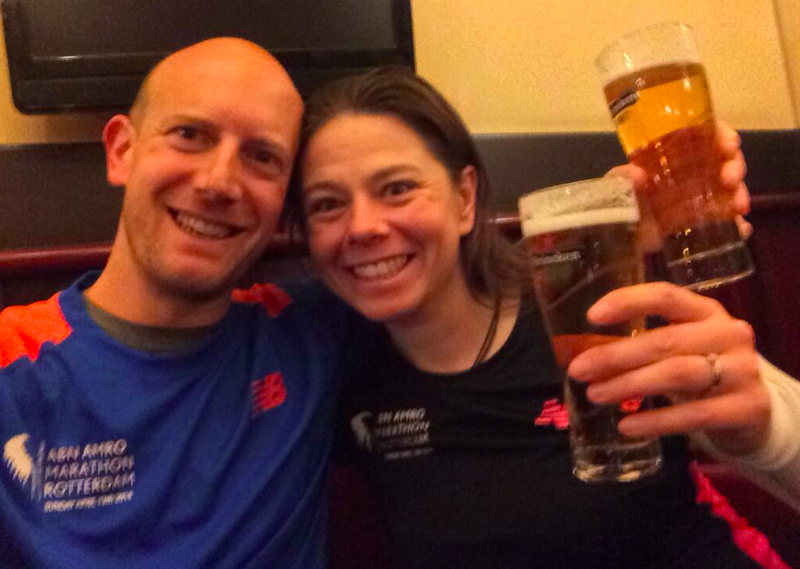 I swear I wasn't this broken after Wales Ironman in 2012, and Mrs has felt better after ultra-marathons! We think there are a couple of reasons for this. Firstly, it's fast, flat, and all on smooth concrete. This means every step is exactly the same - very little variation. Exactly the same movement over and over again, this is bound to break you down. 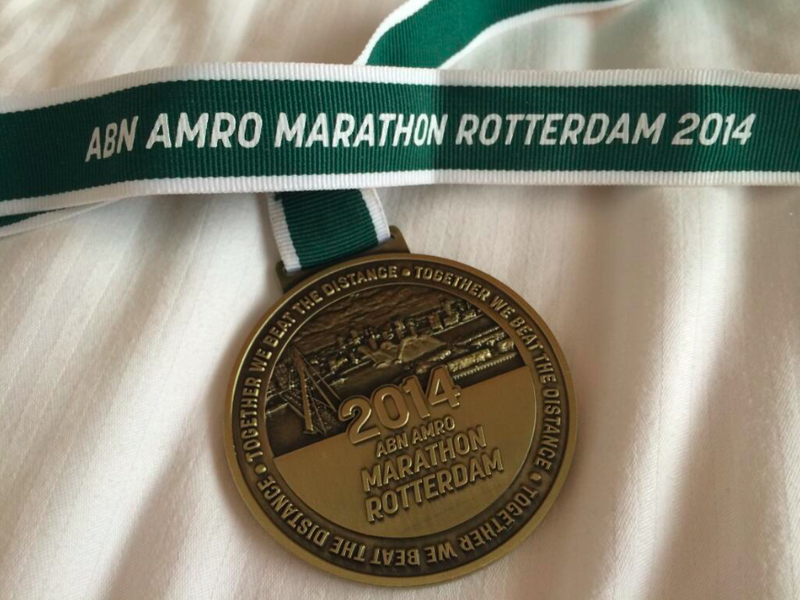 Secondly, marathons are hard! You have to get your pace right from the start - and if you don't there can be a really long way left to run. I've heard so many times that the marathon really starts at 20 miles, or even 22. I now understand why. When it falls apart it happens so quickly, there's no gradual decline here! So what happened? Was my pacing wrong? Was it food? Did I get dehydrated? Was I not strong enough? My heart rate plot tells a story - it looks like there are step changes upwards at about 40 minutes, and 80 minutes. I then stay roughly at the same level until around 2 hours and 50 minutes - when it started getting hard. Heart rate plot - pleased my final 2km effort actually registered! This corresponds to changing temperature - it was certainly getting warmer. It may also be nutrition or hydration - I wouldn't expect those to have any effect for a few hours though, so maybe contributory factors in my drop off? Maybe I should have eaten and drunk more right from the start. On the same day MPHinLondon, who is also on a high-fat and low-carb diet, ran the London Marathon and took a gel every 5 miles starting from mile 5 (and he ran 2:58!) - though he did experiment with carb loading ahead of the race too. There's clearly lots of experimentation to follow, but this is only my first after all. In the last 5 days my mind has already gone form "never again, I've done one now, nothing to prove" to "hmm, I wonder which one to do next spring - or maybe in the autumn". Seems just like triathlon, this sport could get addictive! My failed attempt to complete the Thames Turbo Triathlon Club organised marathon in Richmond Park last year has weighed on my mind. It's the only race I've had a DNF result (Did Not Finish). I immediately vowed to bounce back so I signed up for a spring marathon and vowed to follow a good training plan and be consistent in the gym. The time has now come! Mrs and I flew out to Rotterdam last night after work and checked into the Nh Atlanta hotel. I picked this place as it's right next to the start/finish - if I've learned anything from big events it's "select accommodation near the finish". Hello Rotterdam, this is London calling! 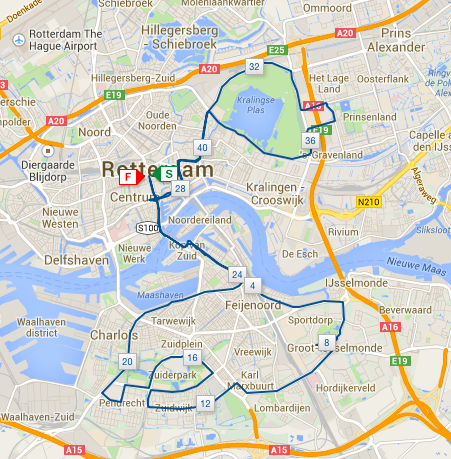 Today was the mini marathon - it certainly was mini, just 4.2km (one tenth of a full marathon, I suppose). We registered this morning and picked up race numbers for today and tomorrow. New Balance are the footwear and sports apparel sponsor, they had some great kit for sale at the expo in the Rotterdam World Trade Centre, so we indulged in a little retail therapy. Come on ladies, you like pink dontcha? Dontcha? Mrs didn't sign up for the mini marathon, so I lined up by myself. I've found previously that if I take two days before the main race as a rest day, and then take 20-30 minutes of light exercise the day before, then I feel strong and ready on the day. As such yesterday, Friday, was rest (and travel), and today was this short run. Even the short events had the full pro treatment - this timing car was for the kids' 2.5km! The field seemed to consist of very inexperienced looking runners. I expected a lot of marathon entrants would run as a pre-race loosener, but that didn't seem to be the case - either that or they were all nearer the front to me. Ready now - let's go! Bang on 15:30, and after a lot of Dutch that I didn't understand, we were off. Well, we were shuffling slowly towards the start line at least. I'm not sure how many entrants there were, it felt like a few thousand. There was a lot of congestion at the start - typical in a mass participation running event. Pacing was about as good as it is at the average parkrun with some runners blowing up and walking within the first km. I didn't mind, I didn't want to run off fast, this was about turning the legs over and relaxing. Seems my legs were ready to be turned over. First km passed in 6:26, then the amount of sudden side-stepping around people who JUST STOPPED FOR NO REASON started to ease off and the second km went by in 5:19. We ran round a slightly odd housing estate type area during the third km which passed in 4:40. OK, so probably going a bit fast now, but really not trying - I relaxed into the pace and found I was passing more and more people. The fourth km vanished in 4:28 - OK what's going on, I'm not trying yet we're virtually at 5km race pace now... The final 200m went at an equivalent to 4:15 pace. Oops! So I polished off the mini marathon in 22:37 on the watch (I assume there's an official time somewhere?) - a few minutes faster than I was thinking, but (and I really hope I'm not making a newbie mistake here) it felt low effort, low stress, and easy going. I'm looking forward to tomorrow now, I certainly feel ready. The game plan is simple. Set out at 5:30/km and hold it as long as I can. If I'm still on pace at 35km, I'll give the pace a slight lift - and if there's anything at all left in my legs and lungs at 40km, I'll leave it all out there. I'm trying not to get hung up on the final time - a finish is the primary objective, anything under 4 hours will be a win (unfortunately just metaphorically). My dream outcome right now would be sub-3:45.